(MIDDLETOWN, CT) September 4, 2014 – With prognosticators giving even odds that Republicans will take over the U.S. Senate after this November’s elections, outside groups are taking notice. Almost 52 percent of ads aired in favor of Republican candidates have been sponsored by interest groups, and that figure is 40 percent on the Democratic side. Groups have spent an estimated $97 million on advertising in Senate races this election cycle, which is up from the estimated $78 million spent to this point in the 2012 election cycle. 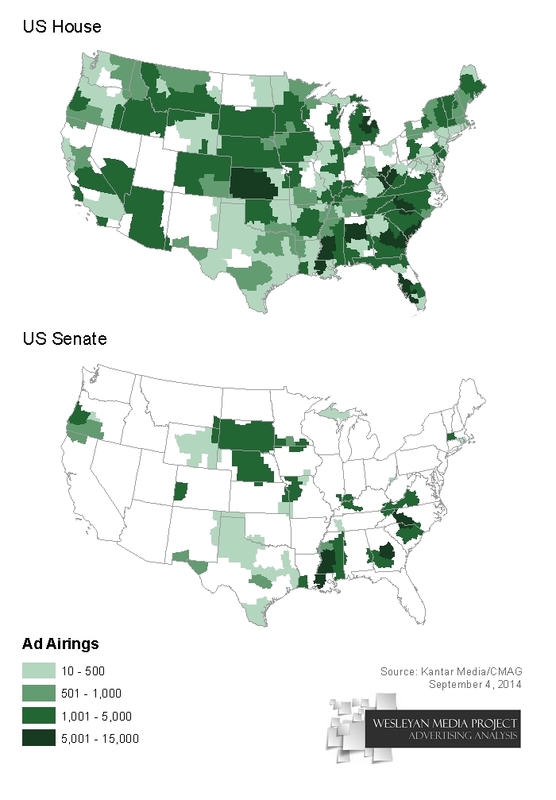 Table 1 provides total ad counts by sponsor in Senate races in the current and the 2012 election cycles, including all ads aired through August 30 in each cycle. Democrats, however, have recently upped their volume of advertising. For the month of August, 17,302 ads aired favoring Democratic House candidates compared to 16,072 ads favoring Republican House candidates. A Wesleyan Media Project analysis, in partnership with the Center for Responsive Politics, reveals that over half (56 percent) of the group-sponsored ads aired so far are “dark money” ads (those from sponsors who do not have to disclose their donors) , which have aired at an estimated cost of over $68 million (Figure 2). In Senate races, 57.5 percent of interest group airings were sponsored by 501c4 and 501c6 groups, sometimes referred to as social welfare organizations, which are not required to disclose their donors. Although dark money ad airings make up a smaller proportion of all interest group advertising this cycle compared to last, the total volume of dark money airings has increased in U.S. Senate races from 106,137 at this point in 2012 to 124,281 so far in 2014. On the House side, dark money advertisers make up 50.2 percent of all interest group ads. As a proportion of all activity, dark money is not as dominant in U.S. House races this cycle; however, the total volume of dark money airings is just shy of the 2012 volume at this point in the cycle (24,847 in 2014 compared to 26,290 in 2012). As Table 3 shows, the top-spending group is Americans for Prosperity, a Republican-supporting 501(c)4 group that does not disclose its donors. Americans for Prosperity has spent $16.7 million on advertising in nine Senate races, ten House races and the Kansas gubernatorial race, airing 33,127 ads in total. Senate Majority PAC (a SuperPAC that does disclose) has spent almost as much ($16.6 million) to air 33,750 ads, favoring Democratic candidates in 10 different Senate races. The third biggest group spender, a 527 organization called Let’s Get to Work, has dropped almost $13.2 million on ads favoring incumbent Florida governor Rick Scott. The dominance of non-disclosing dark money groups is evident in the list of top advertisers. Five out of the top ten do not disclose. Many of the groups that advertised in House and Senate races in 2012 have increased their activity in these races in 2014 (Table 4). Senate Majority PAC, a group that supports Democratic Senate candidates, had aired about 12,000 ads by the end of August in 2012. By the same point in 2014, the group has aired almost 34,000 ads. A similar increase was evident for Americans for Prosperity, a Republican group, which has increased its ad volume from 8,200 in 2012 to 33,000 in 2014 federal races. Two groups, however, have cut back their involvement in House and Senate advertising: Club for Growth and U.S. Chamber of Commerce. Table 5 shows the top ten Senate races by ad count. The race with the highest number of advertisements is in North Carolina, where incumbent Kay Hagen and challenger Thom Tillis face off. Over 44,000 ads, at an estimated cost of $25.2 million, have aired. Remarkably, 80 percent of the ad airings were sponsored by outside groups. It is a pattern that repeats in many of the most competitive Senate races: Interest groups sponsored the majority of the advertising. The most expensive Senate race so far is in Georgia (likely due to higher costs in Georgia markets compared to North Carolina or Kentucky) where David Perdue and Michelle Nunn face each other. Over $26 million has been spent in that race to buy over 37,000 ads. The same figures are reported in Table 6 for gubernatorial races. The hot gubernatorial races in 2014 are in Florida and Pennsylvania. In both states, more than 50,000 ads have already aired, fast approaching the 60,800 total ad airings in 2013’s gubernatorial races in Virginia. What separates Florida and Pennsylvania, though, is the extent to which outside groups are involved. In Florida, over half the airings are sponsored by groups, which compares to just 7.5 percent in Pennsylvania. Although the 2013-2014 open enrollment period has come and gone, attacks on the Affordable Care Act (ACA) have not stopped. In fact, anti-ACA messaging has appeared in roughly one quarter of all federal campaign ads since January 1, 2013, a grand total of 160,636 ads aired across the country. In contrast, a mere 9,264 ads contain somewhat positive (in many cases very oblique, at best not explicitly anti-ACA) language about the law. Not surprisingly, anti-Obamacare messaging was most prominent during the open enrollment period as a proportion of all campaign ads on air (October 1, 2013, through March 31, 2014). In that period, over four in every ten campaign ads aired (42 percent) in U.S. House and U.S. Senate races contained some kind of anti-ACA language. In contrast, the post-enrollment period has seen a drop in the proportion of airings devoted to anti-ACA language (23 percent), but this is primarily due to the increase in campaign messaging generally.